via “They sent all the potatoes to Manchester”: #Anti-Irish #Racism at LGBTQI+ Conferences #WPHRC14 & #Tangentially #Queer. I can’t say how often I’ve had to walk away from talks on race in queer spaces because I felt so personally unsafe by the dialogue. It as if the conversants had never read, or choose to ignore, Edward Zaid, Frantz Fanon, Stuart Hall and Homi Bhabha who all point out that an understanding of colonialism begins with the Irish. But no, time and time again I’ve had queer sisters and brothers (and let’s be honest, it’s been queer sisters and brothers of color) come up to me and do to me exactly what they claim is done to them. Judge me only on my skin tone (and usually gender) with no consideration of my culture. I’ve had to leave a queer squat party in Hackney to get away from a Nigerian law student who was screaming at me that I was failing to take on board my ancestors’ “complicity in racial murder” (she saw no difference between the English and the Irish). In both these events, as in others, the people involved were from highly privileged backgrounds. Yet they felt comfortable ignoring not only the historical reality of the Irish experience of colonialism, but the ongoing modern day reality of the Irish Diaspora in Britain, especially the intersectionally gender and sexually diverse (a friend Lindsay Wolf while running the now sadly defunct Polari – a campaigning group for older LGBTQ+ members – conducted a research report which showed that Irish LGBTQ+ seniors were the group amongst our community members who had the most overwhelmingly negative experiences of the NHS). This chimes with the fact that the Irish are the only ethnic Diaspora group whose life expectancy and rates of education go down when they leave their home country (especially for Britain); while the rates of depression, addiction and isolation go up. Part of this is the insidious process of ‘deracialisation’ – a politically motivated, concerted racist agenda to make the Irish ‘white’, or a better term would be ‘off-white’. I’m speaking here mostly about Britain because the Irish in Britain is the Diaspora community that I know best. From being othered and seen as non-white (there are lots of media representations of the Irish up until the 1950’s which portray us as brown monkeys) – just like Afro-Caribbeans – researchers such as Bronwyn Davis have shown how political decisions were taken to make the Irish ‘white’. Mostly these decisions were done to appease the Unionist Northern Irish (who the British saw and treated as no differently from the Southern Irish) but also to divide the vastly increasing Diaspora working groups from each other. It’s important to understand that deracialisation simply meant absorbing the Irish into the native white working-class – with no consideration for our culture, language, anything that made us uniquely Irish. Some may have ‘thrived’ in the sense that they or successive generations moved up the white ladder of privilege: some certainly acquired the prejudices of the English working-classes: the harsh reality for most is that they joined the bottom rung of the white ladder and stayed there with all the problems that brought. For some groups, Irish travelers especially, the level of ongoing racial hatred is such as to make them amongst the most vulnerable ethniclly white groups in the world (mostly because of their very reasonable effort not to be deracialinised and assimilated). I would expect queer academics to understand this and be supportive – especially queers of color. But I’ve now left two conferences early where Irish subjects were presented in a deracialised manner and queers of color either choose to ignore it or enthusiastically supported it. At the Tangentially Queer conference at the LSE last month a paper was given on the actress/comedian Kathy Burke which, apart from mentioning that she was London-Irish, totally ignored any sense of her cultural background and it’s significance in her work. Having listening to one queer of color after another talk, often angrily, about the effects of erasure I expected some discussion to follow when I pointed this out. Instead silence (ironically the very quality the previous speaker had claim was the quietening reaction of liberal white queers). So I left. However, the World Human Rights Conference at World Pride was far worst. I went to a session on Youth and Queer Identity. There a speaker called Arun Smith simply talked about being a privileged Queer of Colour and how that gave him the right to speak for all Queers of Colour. He kept promising statistics, but it was clear he had no empirical work. It was that appalling ‘a rose is a rose is a rose’ queer presentation where the speaker vacillates with themselves in dense auto-ethnographic argument (to make up for the lack of actual empirical data) as to whether they should be using up the space instead of more deserving others, but always in the end come down in favor of hearing their own voice. Lots of people loved it in the audience, but then I’ve noticed that Canada is a country where a certain kind of modern queer minstrelsy plays well. It was when he started talking about his Irish background that things took a darker turn. Like most of what Arun said, what followed was incoherent, contradictory and felt like he needed to be exploring it with a therapist rather than sharing it with a conference. But it revealed at least how one mixed-race Irish-Indian Canadian from a relatively privileged background is expected to present at least half of his cultural heritage (to an appreciative audience). The Irish had suffered under colonialism because “they sent all the potatoes to Manchester” (I can’t explain how racist this is as a dismissal of The Hunger) but now deracialisation meant “the Irish beat up all the Jews.” And all the while people clapped – it really did feel like a certain kind of queer minstrelsy for a liberal white and establishment minority ethnicities. I was here to conduct participant-observation on my research cohort which left very little time to do any other empirical research. But I went to the Youth Space, besides Buddies in Bad Times, at World Pride. It was clear that some, not all, of the spectrum youth using the space were extremely vulnerable (well done to the organizers). It was also clear that very few, if any, were from privileged Indian backgrounds but many were from impoverished white backgrounds including Irish. It is bad enough that so much was stripped from us in the Diaspora by the process of deracialisation. It is equally as sad and violent that our brothers and sisters of color should suggest that it was our own fault due to our skin tone. 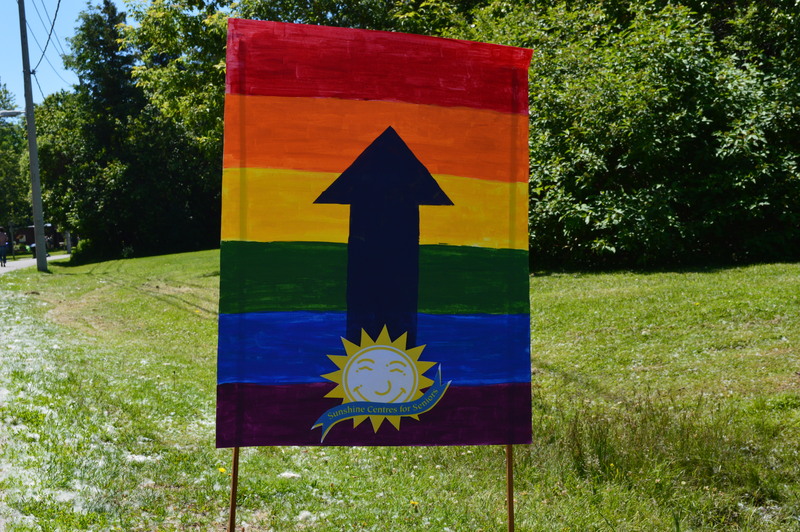 via Two-spirit Research, #Asexual Activism and the politics of #Pride Parades at the World Human Rights Conference #WPHRC14. The opening day’s sessions of the World Human Rights Conference were as engaging and thought provoking as I’d hoped they’d would be. The first session I attended – on lessons learned in Two-Spirited research on HIV/AIDS wellness and longevity with Two-Spirited cohorts – was fascinating for a researcher from Europe where we almost totally ignore all approaches but the Western scientific model. Yet, what these scientist and community leaders were doing was combining both Western and indigenous approaches, not without tensions as they freely admitted. 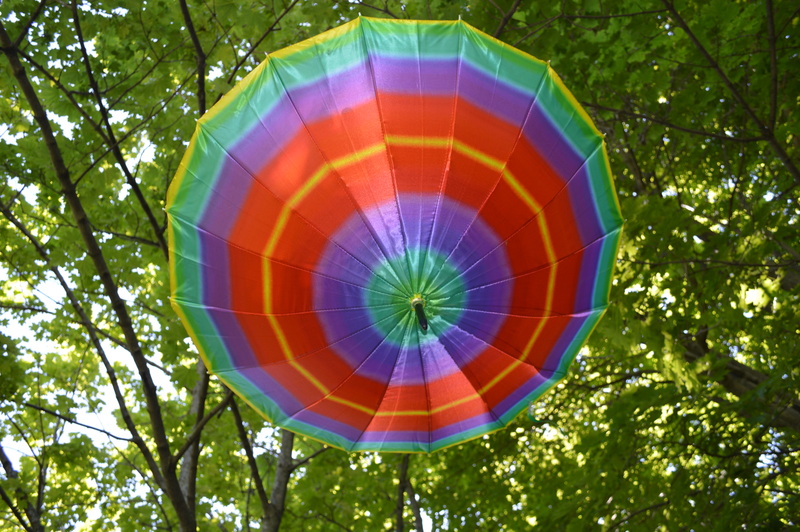 I think it was that critical honesty on both sides that made this attempt to work together for the sake of HIV+ Two-Spirited people so exciting – as one of the elders put it ” research that wasn’t just helicoptered it and one day might appear in a book you wouldn’t read. Research that grew from our own communities.” For anyone interested the project is 2-SHAWLS. Obviously I’m biased (Asexual Activism is my doctoral subject) but I thought the session on Asexuality in Sexual Education was outstanding. Again, as with the first session on Two-Spirited research, what I liked was the honest critical reflection that CJ, Cole and Michael brought to their subject. What I think that they did especially well was mediate a balance between an Asexuality 101 (which clearly some attendees needed) while also touching on some of the broader, deeper issues Asexuality brings up both socially and specifically for the LGBTIQ+ Umbrella. It’s hard to give justice to how many topics that they raised in an hour and a half, but some of the subjects touched on were the relationship of Ace phobia to homo/bi/trans phobia, gender panic, expanding the definitions of desire and emotion (a really exciting section with a lot of potential for work with young people) to value non-sexual relationships, critically exploring the boundaries of consent, etc. All in all, a great session and I’m going to have to put a bit of work in for the Asexuality Conference to raise my game. The third and final session that I attended for the day was on the politics of Pride Parades. I have mixed feelings about this session; less because of was said that what was unsaid. Although the moderator Shelley Craig is a chair of World Pride there was no critical discussion of World Pride. This lack of critique fits in with my overall impression of World Pride in Toronto – I like Canadians, but they’re incredibly smug and neo-colonial. The whole theme of World Pride Toronto seems to be ‘Look at all the bad things the AMERICAN religions do around the world, and, look how good we CANADIANS are at helping the poor victims of the AMERICANS (just don’t look too closely at what’s happening here in Toronto with changes to immigration laws and increased police presences in poor areas).’ That said, the three speakers on the politics of Pride Parades raised important issues about who, where, what and how Pride Parades operate in different socio-political spaces around the world. Emily Craven showed a video of the I in 9 political action to reclaim Pride events from privileged whites areas of Johannesburg. It was a interesting talk marred by Craven’s subtle misandry. There were almost constant dismissive references to ‘white boys in bikini shorts’ as emblematic of what had gone wrong, yet in the video shown the most offensive comments were articulated by white women and the organizer was apparently a woman. I’m actually growing increasing tired of LGBTIQ+ spaces where it’s acceptable for women to articulate misandric comments about gay, bi or queer men. Sonal Giaani talk about Youth and the Mumbai March was inspiring. Queer Azaadi Mumbai are simply an exceptional group of spectrum youth. That they continue to do what they do and remain not only determined, but filled with humor, makes me happy about the world. Listening to Sonal reminded me why Pride matters so much – as indeed do so many of my own research participants. Kevin Moss’s paper on Prides in Eastern Europe was a far more traditional academic paper. It was a complex argument, but Moss was arguing the dangers of helicoptering in a ‘global’ mode of Pride, that ignored local traditions and cultures and that might actually end up being utilized by far-right groups. In other words, on issues of sexual and gender tolerance, if Eastern Europe feels that Western Europe is simply telling that it is the stupid yokel cousin (think of the pictures of lip-sticked Putin) – that plays right into the hands of Putin and others. As I said – a long, but productive first day. I was too tired to go to the plenary session (I know this sounds weird, but I’m getting tired of people clapping Edith Windsor). I decided to have a radical haircut and beard trim. 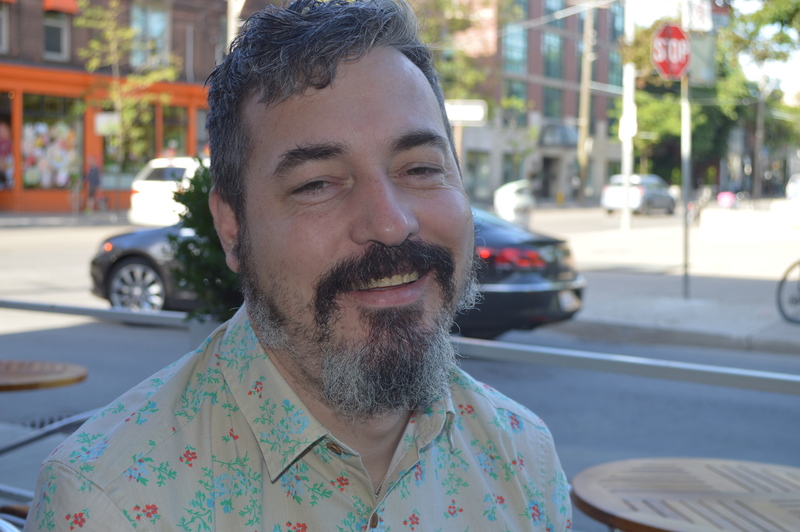 I put it down to the heat of Toronto (and needing some ‘air’ on my face and head), but the truth is I just didn’t want to look like a hipster daddy while staying in a part of Toronto where hipster daddies abound. 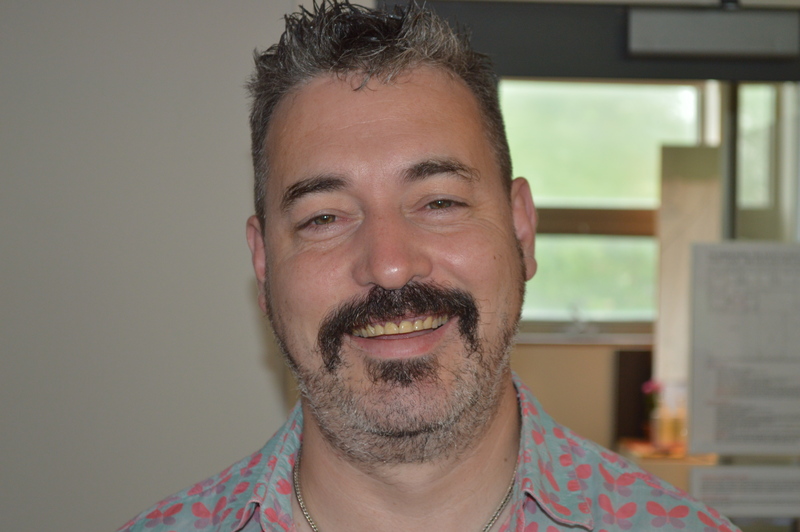 I find the homosocial way in which they nakedly stare with admiration at my choice of floral shorts, ironic tee-shirts and silver-fox facial hair (with no physical intentions to follow through) has provoked an existential crisis. One even came up to me to compliment me on my ‘Monte Carlo’ style and how it would ‘lay the ladies’. My new mustache, stubble and haircut is much more gay. Gender panic, sexual panic, moral panic – I’d say the greatest panic for most gender and sexually diverse folks is the panic over how ‘real’, how ‘authentic’ we appear. It can police our lives in such subtle ways that, faced with groups of affluent white men coming out of coffee shops looking like me – I did something I haven’t done in years. I wanted to look really gay. 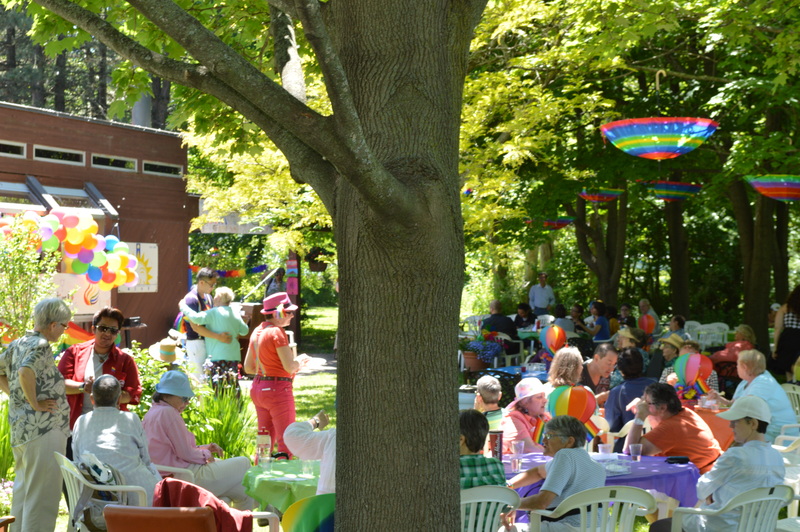 via Bring me sunshine: Attending the Intergen Rainbow Pride Festival at #WorldPride 2014. In what has already felt at times an overly commercial, and unnecessarily branded World Pride, it was a pleasure on a day trip to the islands in Toronto Harbor to bump into Pamela and Jason. Pamela and Jason are workers at Sunshine Centre’s for Seniors – a wonderful organisation that seeks out isolated and frail seniors, including LGBT seniors, who are at risk for depression and need to be connected to a supportive community. 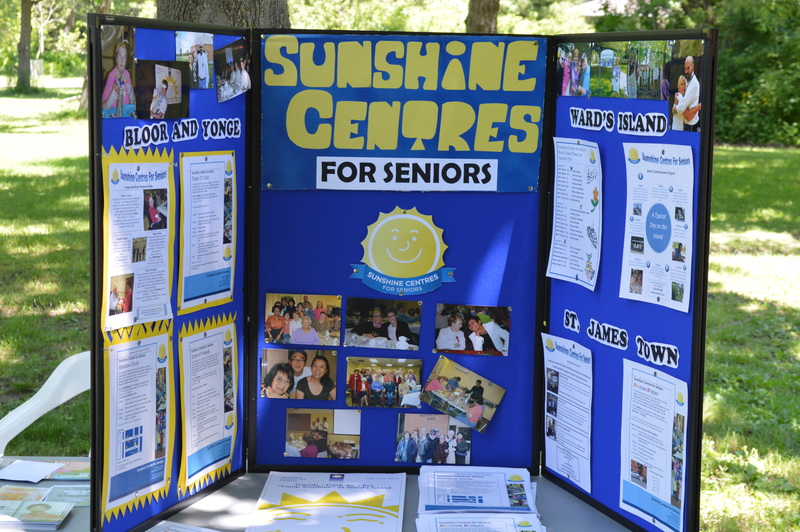 Through the contacts and friendships seniors develop at Camp Sunshine, they form meaningful relationships which will enhance their quality of life and allow them to contribute to others. When we bumped into them Pamela and Jason were busy blowing up balloons and making decorations for their very first Inter-generational Rainbow Pride Festival the next day. They were extremely kind to invite us back for the event itself. I have to admit I was a little worried getting the ferry back to the island the next day. In my experience, events with vulnerable seniors – like events with vulnerable young people – are often cringe-worthy. Nothing could have been further from the truth. 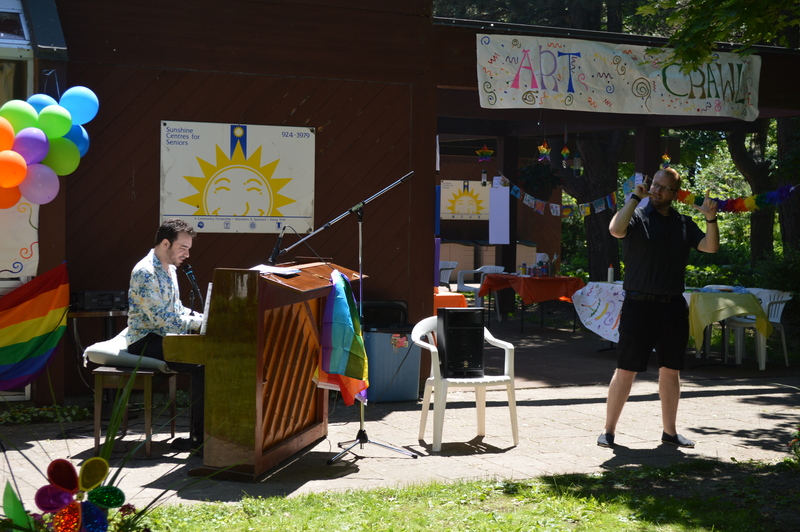 The Rainbow Pride Festival was a joyous event full of food, music (outstanding live jazz ), a little politics, some great dancing. It was also – in terms of social mobility, ethnicity, gender and sexual diversity – the most inclusive World Pride event that I’ve been to despite many of it’s attendees being 60 or over (why that should have surprised me, put down to my own prejudices). Part of what I think made it so successful was the focus on intergenerational celebration. One of the most abiding, and damaging, barriers in gender and sexually diverse communities is the intergenerational barrier. That spectrum people of different generations have nothing to offer each other if they’re not interested in shagging each other. 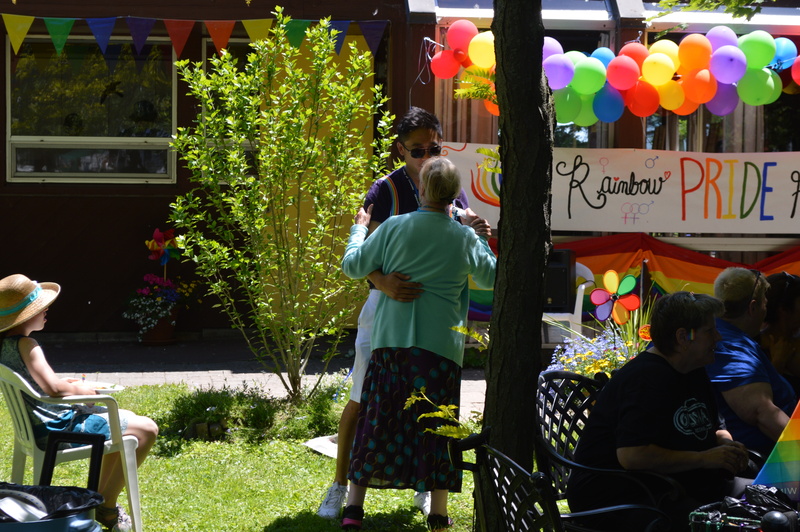 One of the really lovely images of the day was watching young people, draped in rainbow tat, gold lame or tutus, wandering around checking on food, drink or just having a chat or dance. Before we left (I had four Pride events to attend that day though none were as much fun as this), I had a quick chat with Pamela who is one of the senior workers at the Sunshine center. She was clear that part of the reason that they were able to do this was because of the money that came because of World Pride, but Toronto had guaranteed that money for a further three years. I couldn’t help but think that, as much as I find the branding of World Pride 2014 difficult, events like this make it worthwhile. It also struck me that I can’t recollect a similar social benefit from the World Pride a couple of years ago in London. 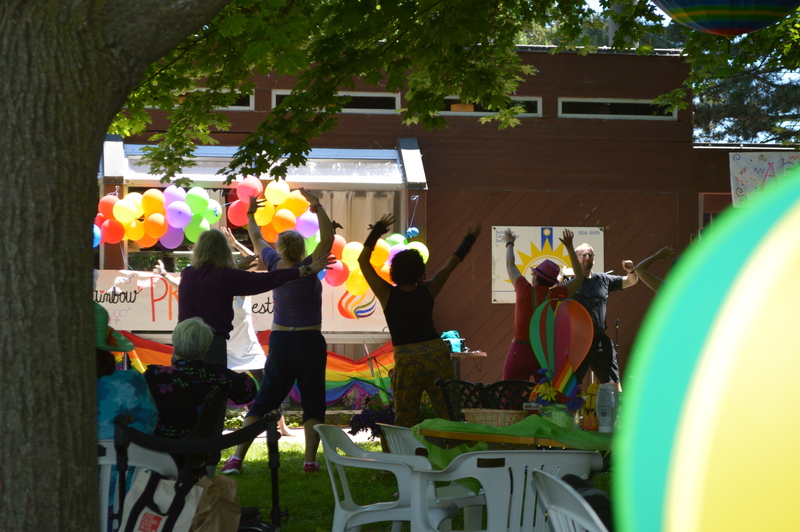 Yet, it’s clear for many folks – the larger events at Pride festivals aren’t inclusive – whether due to age, family concerns, mental health issues, etc. 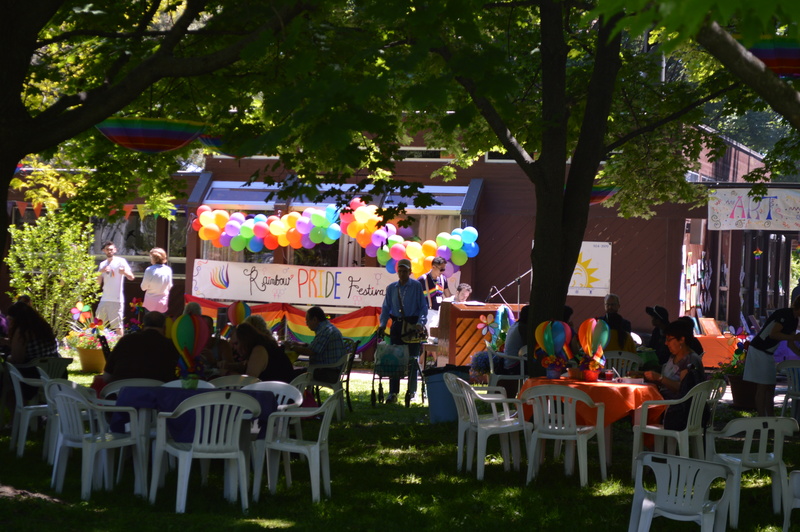 There was also something about the back-to-basics inclusivity of the Rainbow Pride Festival that reminded me of Pride events I attended in the 1980’s where community came before the branded logo.